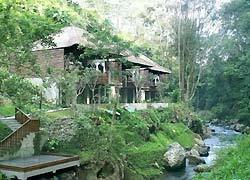 Bali Spa Broad natural environment including the rice terrace and Putanu River is where Spa at maya ubud located at. 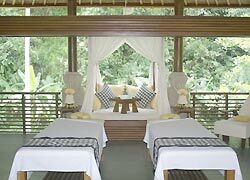 For one guest use, they offer treatments with great view in the private treatment pavilion, and for couple guests use, they offer the gouges double treatment pavilion. 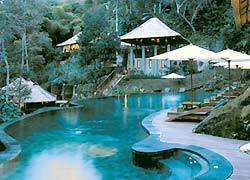 PEVONIA is a famous company which cooperates only with high quality spas. The products they use in the course have many celebrity fans. Propolis, Micro Emersion Jell with rich sterilizing, and Lavender cool down and moisturize your skin. Recommended for people who got a red face and sunburn. Micro Emersion Jell with Propolis and Lavender cool your skin down. It improves pontaneous cure of your skin and gives your skin full of energy. Recommended for men who has damaged skin by shaving. It is Facial for anti-aging. It is the body treatment to improve skin condition with tropical fruit essence for the early stage of aging skin and damaged skin by UV. The latest cellulite treatment improves metabolism to make your body slimmer. This course uses high diet effect products such as 100 % natural fine grain green coffee with natural chlorogenic acid, Chinese Wolfberry, protein, essential oil, etc. to remove cellulite, and lymph massage to improve blood circulation and detoxify swell and toxin. Massage by traditional Balinese techniques with aroma oil from the back to legs following a flow of the lymph fluid eases away all the bodily tension. You will experience a smooth whole body massage with a full of aroma oil. By pessuring various points on the soles of foot which are systematically linked to all parts of the body, it prevents illness, sleeping problems, stiff shoulders and poor circulation. This course is a great way to improve spontaneous cure that everyone have as well. 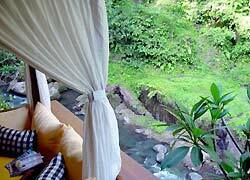 Balinese have been using Traditional herbal remedies for thousands of years. It works well to warm the body, relieve stiffed muscles and alleviate minor rheumatic conditions. They use steamed cotton balls which has herb inside to push roll on your body. Your mind and body will refresh deeply. Enjoy the rhythmical massage by two therapists. It ends up with Herbal Bath. This is a rhythmical massage ease the tension from toes to an upper body. It finishes up with a relaxing time in the Herbal Bath. After the treatment you choose: Treat the Feet or Reflexology, enjoy herbal treatment and bath which improves blood circulation. Recommended for men as well. 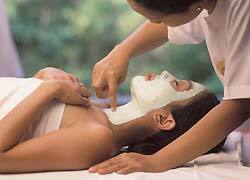 You can refresh yourself by Maya massage and a favorite type of Body Mask. Earl Grey body lotion they use keeps your skin smooth. 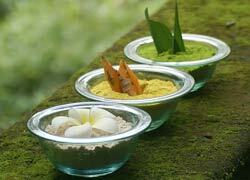 This course is combination of scrub with spice and herb, and Maya Massage. 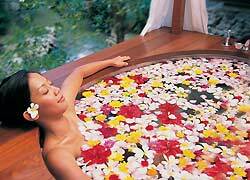 After the treatment, you can relax in the Flower Bath. You can also choose a favorite type of scrub. This is a traditional herb treatment with Balinese massage to improve blood circulation and ease the tension of your muscle. You can choose a favorite type of Foot Treatment, Treat the Feet or Reflexology. 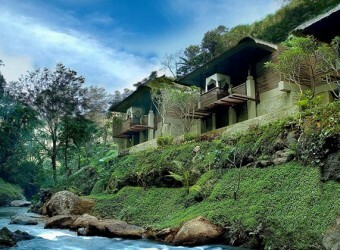 Maya Massage, your favorite type of Body Scrub and Facial Treatment are included. A whole body massages and Flower Bath make you feel relaxed. Enjoy the relaxing smell of chocolate which stimulate a brain. It is not only improving relaxation, but also keeping skins moisturized. You can get a detox effect as well. The sensitive scrub with smell of orange removes old horny substance and spots on the skin. They use lotion to keep your skin clear and moisturized at the end. Boreh is a traditional Balinese remedy which has been developed to detoxify and warm up the body by using a stimulating mixture of powdered cloves and cinnamon. A whole body scrub with natural essence added Yogurt removes body wastes and improves blood circulation and body metabolism. 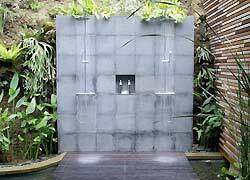 Flower Bath is the last enjoyable moment in this course. The original treatment using Orange, Avocado, Cucumber Yogurt, etc. You can get a neck, shoulders and hand massage which represents an upper body relaxation. The Facial Care with Products of National skin care brand in Indonesia “Biokos” contain full of collagen and seaweed essence keeps your skin fresh. Ideal to soften the visible sign of premature ageing , fine lines and wrinkles, sagging and loss of contour, cooling, calming, pressurized oxygen will increase absorption of the rejuvenate serum and naturally improve your skins moisture levels, while vitamins and antioxidants protect and defend. Your skin will emerge deeply hydrated, balanced and glowing with vitality. Ideal to soften the visible signs of expression lines and lip lines, fine lines and wrinkles, prematurely ageing skin. A quick wrinkle reduction, professional strength serum with botanical peptides, directly target expression lines and wrinkles. Instantly reduces the visible oppearance skin ageing with accumulative and long term result. Free transportation is available only in the center of and around Monkey Forest in Ubud. Need extra charge for other areas. There are menus for children over age 16. All menus include Counseling and Herbal tea. It was the first time for me to have a massage using aroma oils. I took this massage because I thought it has also healing effects. I felt very relaxed when gently getting massage by therapist.